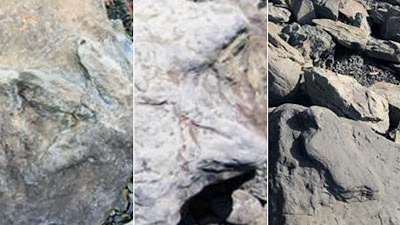 There may be one more consequence in the works for "Jurassic Park," but a fossilized version was just discovered along the Yukon River in Alaska. Thousands of fossilized footsteps of both meat eaters and plant eaters were found in the rocks beside the river. Paul McCarthy, a professor of geology at the University of Alaska Fairbanks, said he was shocked at just how many fossils he and his colleagues found. "We found dinosaur footprints by the scores on literally every outcrop we stopped at," he said in a statement. "The tracks were so abundant along the Yukon River that we could find and collect as many as 50 specimens in as little as 10 minutes." Unlike other dinosaur footprints, many of the fossils discovered in Alaska protruded from the rocks instead of indented inwards. Mark Norell, the head of paleontology at the American Museum of Natural History, said to think of what would happen to your footprints on a wet and sandy beach. "If there's a big storm and the footprint is covered in clay blown from the hillside, it will cover the footprint," he told ABC News. After it hardens over millions of years, the clay molding ends up capturing what the foot itself looked like. "It's like you're seeing the animal's foot while it was alive." There are many sites filled with dinosaur fossils in the contiguous United States, but Alaska hasn't been explored quite so thoroughly. "This is the kind of discovery you would have expected in the Lower 48 a hundred years ago," said Pat Druckenmiller, the earth sciences curator at the University Of Alaska Museum of the North. "We found a great diversity of dinosaur types, evidence of an extinct ecosystem we never knew existed." Norell said it's a little too early to make those kinds of claims. "They're not the most groundbreaking fossils, but they're interesting," he said. "It's important to see how exactly these fossils add to the diversity of the dinosaurs we know of."